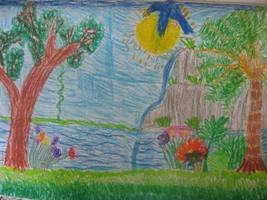 For school this week, Tom and Rosie had to draw a picture of a beautiful garden. Living in PNG certainly gives a great opportunity to see green plants everywhere, exotic flowers and plenty of water. On a clear day, we can see the mountains way off in the distance. When there are storms, we see (hear... and feel) some spectacular lightening. There are beautiful birds (although too scared to be easily seen here on the station). We praise God for His beautiful creation. 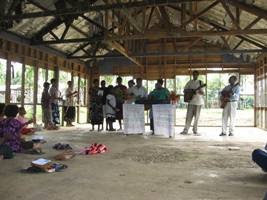 We ask prayer for the monthly outreaches from the hospital 'English' Church to the local villages. 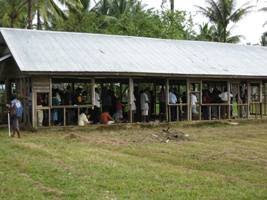 Here is a picture of church at Briompenai village. Please pray for these outreaches and pray for the villages around Rumginae. The mission station has been here for over 50 years but there is still a lot of darkness and fear in people's lives. Please pray for Briompenai, Menumsore, Rudmasuk, Ralengrae and Tope villages in particular. Rosie was a very brave girl this week. We had a trip up to Tabubil where the dentist found she had a cavity right down to the nerve. She has a special dressing on this and will get it filled on Friday when we again do the 6 hour return trip! She is so much happier now the tooth is fixed! Could we please ask for prayer for the preparations and practicalities surrounding the upcoming missionary conference at Mount Hagen in 1 1/2 weeks. There is a lot of organising being done by us from Rumginae and others in other places... including trying to organise things from Thailand! Pray that the organising would go smoothly and that it will be a great time of biblical encouragement and teaching. On the ward, Praise God that W**e has recovered. We were very, very worried about this lady who came with severe dehydration from constant diarrhoea AND pregnant but the baby had died AND her kidneys were not working very well at all AND she had extremely high blood pressure. We were able to help her with a safe delivery, balance her fluids very carefully, replenish her lost fluids, treat her blood pressure as well as help her discuss the nightmares and fears she was having. Continue to pray for her and her family that they will be really trusting Jesus to look after them. Pray also for E**a who continues to grumble along with high temperatures! We have been getting some help on the internet (Swinfen Charitable Trust) by a Professor of Infectious Diseases in England! Pray she will recover soon.